I ignored that advice at first. It didn’t feel true to me. Plus, I was still in a job back then. My main focus was making the most of my coaches training. Anything having to do with actually starting my business was not on my mind at all. But when I started my business in 2003, I soon learned that I knew nothing about building a business or getting clients. Which caused a lot of (money) stress. It still didn’t feel true. BUT – I talked myself out of my truth. After all, SHE was making big money, and I had trouble finding even one new client. Obviously, she knew more about doing business than I did. It was time to let go of my resistance and meet people face to face! Network! Get out there! Why did it not work for me? BECAUSE THIS IS NOT TRUE FOR ME AND NEVER HAS BEEN. It’s not aligned with my soul nor with my personality. Why did that outgoing stuff work for her? Because it was true for HER. It was perfectly aligned with HER soul and personality. I ignored my own truth because I thought I was either stubborn for the wrong reasons, or self-sabotaging, or resisting her advice out of some kind of fear. Which were usually the reasons I ever went against my truth. It NEVER pays off to go against your truth. It NEVER pays off to do anything that isn’t aligned with your personality and soul. It NEVER EVER pays off to ignore your truth in ANY area of your business and life. There are as many truths as there are people. What’s true for you is not necessarily true for others. And what’s true for me is not necessarily true for you. But what we ALL have in common, is that ignoring your truth NEVER works. Your truth works uniquely for YOU because it comes from YOUR soul. Because it shows you YOUR path. Because it helps you express who YOU are. Because it helps you live YOUR purpose. Because it helps YOU BE YOU. That’s why YOUR truth ALWAYS WORKS FOR YOU. And why ignoring it never does. Is it bad when you ignore your truth? Will you be doomed and forever lost? There’s always a lesson and there’s always a gift. if you make it a habit to LISTEN to your truth and act on it no matter what. But ignoring it does not bring you a fear-free life. Yes, it sometimes feels uncomfortable. But ignoring your truth feels just as uncomfortable – and lasts a lot longer, too. Yes, it’s not always easy to know where truth ends, and fear begins. 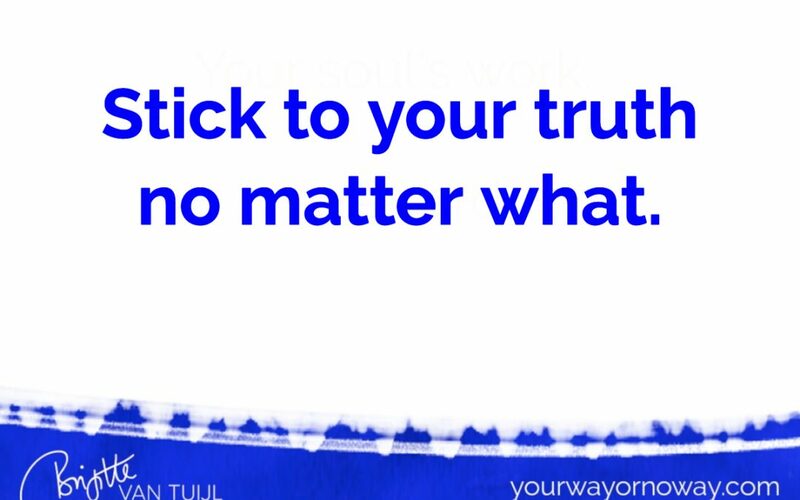 But when you allow yourself the time to FEEL INTO your truth and you don’t act until you KNOW what’s true for you, you will ALWAYS get to the bottom of your truth. I threw out my entire coaches training this week. It was the ONLY thing that survived all my radical clean up rounds over the past 20 years. But this week, my truth told me to get rid of it. What I needed from it, I long got from it. There was nothing left for me there. I did check to make sure, though. So I went through all my notes and kept a couple of things that still spark my interest. Was either fully integrated…or no longer true for me. What’s YOUR truth telling YOU now? And are you listening to it? Be true to YOU in everything you do, baby. P.S. : You know in which area people quickly lose touch with their truth? Because marketing pushes SO many buttons at once, it triggers many doubts & fears at once, too. And fears and doubts are what take you away from your truth. But your marketing only works when it’s aligned with you – and when you fully honor YOUR truth in it. That’s why this month in the Divinely Selfish Community, you receive a Divinely Selfish Marketing Mindset Master Class.